Truly it is a work of heart to invest hours of time, effort, and energy into the lives of young people each and every school year. I will miss this year’s group that have managed to “get under my skin” and make me love them. Most of them make it super easy to love; some hold others at a distance by erecting barriers of bad behavior as a defense mechanism. My prayer for those students is that they find someone some day who will knock that wall down and love them in spite of themselves. 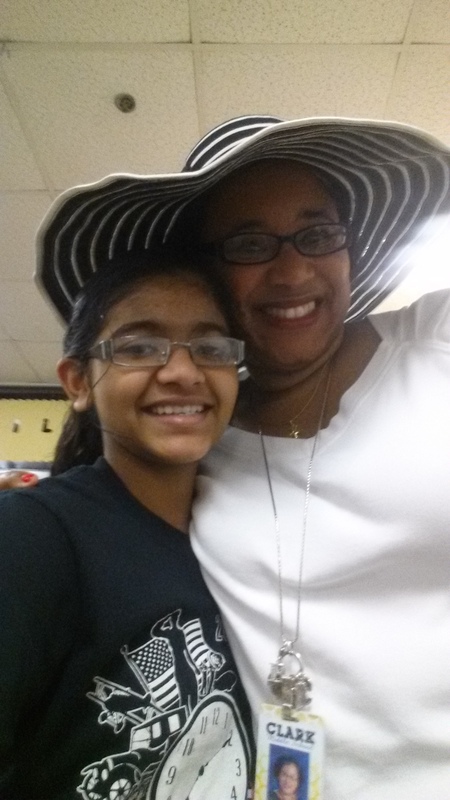 Pictured below is one of my students from this year with me last Friday before the day began. She loves to hug me when I growl at her, and she boasts a wonderful quick mind. I will miss my little nemesis next year. My husband and I went to our son’s jazz band concert at a local park. Middle school students were all over the place because their campuses feed the high school my son attends. Some of them were my students, current and former ones, who said hello when they spotted me underneath my smile-covered umbrella. I spoke to others, and they came over to say hello and meet my husband. I saw and spoke to a couple of parents about their wonderful young people. I even admitted that one of them is a favorite and swore her to secrecy. I’ll call him Mr. Bucket since he claims he makes buckets when playing basketball. He makes me smile whenever I see him in class. He makes my day. I cannot count the number of hugs I received tonight, nor will I try to measure the amount of love poured out into my soul. One mom teared up and told me I was a blessing to her and her kids. I admonished her to not cry because I have to survive the next few days with my kids. When we returned home, my husband reminded me that no matter how many times I grumble about the trolls, there are kids who l-o-v-e me and will hug me without being prompted to do so. They simply love me. LORD, I am undone. Thank You, for reminding me of Your love through the arms of these young people. I love them so much, and the ones who I currently have under my care will be sorely missed. Would you believe some dust just blew into my eyes and made them water like mad? That’s my story, and I’m sticking to it. My students will be working on reading passages, writing prompts, and listening skills in the last nine days of school. I tried to find high-interest articles that would fire their imaginations as they learned something new. I also plan to play a review game about sentence structure and function using Kahoot! on the penultimate day of school. The majority of my students may be vacation-minded, yet they are compliant with my directives. A small percentage would love to pull their cronies off-task and openly rebel; however, I actively monitor their activities to keep order. One of my younger colleagues passed on a suggestion that I am conditionally allowing—reading books on electronic devices. She utilizes the Overdrive app on her device. Some of her recalcitrant clientele received instruction on how to download and use it, too; now, they are engaged with books of their own choosing. Our librarian had previously mentioned this to our classes; it was on my phone at one time; somehow, I forgot about it. Now, I am allowing my students to download the app and a book with the condition that if I ask to see their phone, I’m going to see a book and nothing else. We shall see how it progresses. I just spent about sixty or so minutes of my life updating the page for our student learning hub which uses the Moodle platform. The new theme they are making us use isn’t entirely user-friendly when one has an older model of computer and/or mouse. It may also work better with a more rested teacher sitting at the keyboard. There is always tomorrow to continue, so I shall. I just need to figure out how to change the background color to something other than white. First of all, I need a cup of tea and time with my novel before I turn in for the night. Make it a great day! 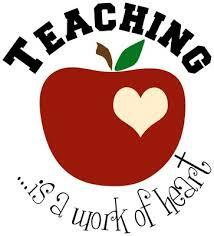 The first Tuesday of May has been designated as Teacher Appreciation Day. I thought I’d take a moment or two to make note of some of the best ways to appreciate your teacher. These are also steps parents can encourage in their children. Follow directions the first time. This shows that you have honed your listening skills. No lines furrow my brow. My face remains smooth and placid. You have a good class period with me, and we both leave happier. If you see me snap off the heels and start lacing up the running shoes, then it’s time for you to run. You have entered the danger zone, and I am about to get you. I hope you ate your Wheaties, kid. Respond in an appropriate manner. If your teacher wants you to say, “Yes, ma’am” or “No, ma’am,” then do it. If she wants you to simply respond “Yes” or “No” in a civilized tone, just do it. When you score well on a test or project, be happy but not disruptive about your celebration. If you don’t score as well as you like, don’t broadcast to the entire class about your failing mark. Your classmates become embarrassed for you. If you are in trouble, please don’t smirk or grin at me. Smirking shows a lack of respect for what I’m trying to tell you, and it’ s frustrating to feel that you aren’t listening. If you are so mad that you want to punch someone or something, take a breath, and ask your teacher if you can visit the counselor to talk it out. Maybe you can talk to your teacher about it later on after things have calmed down. Write her a heartfelt note. Just knowing that my class brings a smile to the faces of some of my students makes me happy and puts a spring in my step. I keep those notes forever and look back at them when I have a rough go of things. I even keep kind parent emails, too. Take an interest in her life. Remember that she is a person, too. If your teacher displays pictures of her family and friends, it means she has relationships outside of school. Those people in the pictures are her lifeline. They make her laugh at inside jokes. They make her stomp in with a black cloud over her head. They make her cry happy tears with surprise balloon or flower bouquets. If she has pets, ask about them. This shows that you have an interest in her beyond the grades she records. Respect her privacy. On the same token of taking an interest in her life, don’t intrude on her family time. Some teachers maintain an online social media presence that is private. Others don’t bother with Facebook, Twitter, Instagram, etc. Sometimes that angry email doesn’t need to be sent at 10:30 P.M. She has to respond to the request in a timely manner (the next morning! 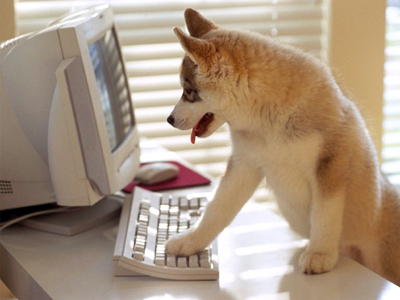 ), and the little ding of the email signal just woke her up from a dead sleep. Now she’s thinking about how to get back to sleep. If she has a published phone number, never call her at home. Save your phone calls for school office hours. If she’s working in her yard, allow her to do that in peace. Making a U-turn in the cul-de-sac to stop by and “have a chat” is out of line. My home phone number is unpublished because a student called me at home during my first year of teaching. Saying hello at a restaurant, grocery store, etc. is fine, but don’t overstay your welcome. Don’t sting. Some parents love to get in the “last word” at the end of the day or right before a vacation or weekend and fire off a harshly-toned email. Email correspondence is forever. Those words once sent cannot be taken back. Take a few deep breaths, take the dog for a walk, or take a few moments to yank recalcitrant weeds out of the ground. Count to one hundred before you hit the send button. The recipient will have to respond to you, and it may take a great deal of restraint to contact you with a civilized tone of voice. If you won’t say it in person, don’t say it in print. Think about how you would feel if you were on the receiving end of written vitriol. It hurts. Maintain reasonable expectations. Your student is your baby, and you have nurtured him or her from a young age; however, even our own babies surprise us with their actions, words, and thought-patterns. This comes about as they grow up a little bit each day. When or if your student’s teacher calls, and it’s not good news, give her a chance to tell you everything she can before you take her head off. If she’s made an error, show grace. If you’ve made an error, allow her to show you grace. Regardless, take the high road. Even the best students who would NEVER do — will make a mistake or not turn in an assignment on its due date. They are human, their teachers are human, and their parents are human. Preserve the good name. Bad-mouthing a child’s teacher in front of the child is a sure-fire way to sabotage the relationship between your child and her teacher. “That Mrs. X is just too demanding!” Little pitchers have big ears, and they mimic our actions, speech, etc. There have been cases when I’ve had a decent relationship with a student only to somehow upset his mama and/or daddy, and then I pay the price with a child who is disrespectful to me because it’s an acceptable practice at home. This bleeds over into social media with sites that allow criticism without rebuttal. Hiding behind a vitriolic post is cowardice–plain and simple. 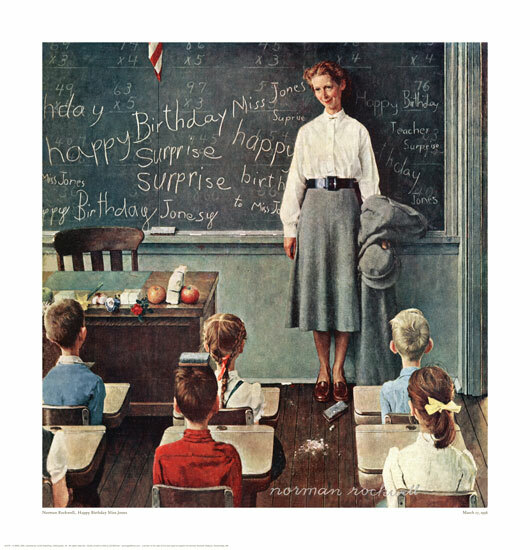 Happy Birthday Miss Jones painted by Norman Rockwell. The Saturday Evening Post, March 17, 1956.